If you have diabetes, at some stage you are likely to be affected by diabetic retinopathy, which is damage to the eye’s retina as a result of high blood sugar levels. The longer you have diabetes, the higher the risk of this damage occurring to your eyes. During the early stages, diabetic retinopathy is symptom-free, but left untreated it can lead to catastrophic eye damage and can even cause permanent blindness. However, increased screening and advances in treatment are changing the outlook for people with diabetes. Today, if it is caught promptly, diabetic retinopathy can be easily treated, completely preventing vision loss. At The Harley Street Eye Clinic, we use the latest retinal scanning technology to detect diabetic retinopathy at the earliest possible stage. Even if your eyes have already suffered significant trauma, we have treatment programmes that can still protect your eyesight. We use the latest laser and surgical techniques to rejuvenate the retina. This prevents any further damage, avoiding the loss of vision that was once inevitable for people with advanced diabetic retinopathy. Diabetic retinopathy is a common complication of diabetes. Diabetes occurs when the level of sugar in the blood becomes higher than normal. These high blood sugar levels can lead to weakening and damage of the tiny blood vessels of the retina, eventually causing blood vessel blockages, and blood and fluid leaks that damage the retinal cells. Sometimes the macula is affected, which is an area found in the centre back of the eye; at other times the disease affects the outer region of the retina that is used for peripheral vision. At first this damage has little impact on your eyesight and you are unlikely to realise that there is a problem. But the onset of symptoms is often very sudden, and can rapidly worsen eventually leading to blindness if not managed appropriately. How can The Harley Street Eye Clinic treat your diabetic retinopathy? The most effective way to tackle diabetic retinopathy is to catch it early. This can avoid progression of the disease, and maintain healthy vision. 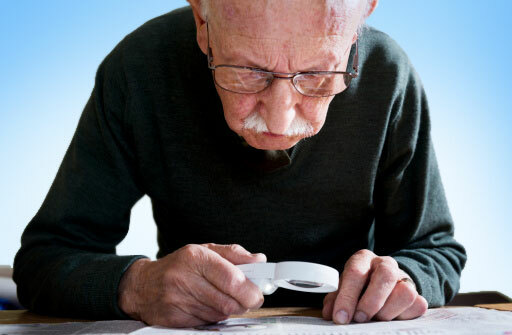 If you have diabetes, it is important to have your eyes examined once a year to check for damage. The earlier diabetic retinopathy is detected, the more likely it can be treated, slowing or even stopping disease progression. Keeping a tight control of your blood sugar levels, blood pressure and cholesterol, is essential. This will minimise the chance of damage occurring to your eyes. At The Harley Street Eye Clinic we use the most advanced Optical Coherence Tomography (OCT) retinal scanner, to diagnose diabetic retinopathy. This enables us to determine the exact stage of disease and prognosis, and to design a treatment plan tailored to you needs. Unlike many clinics, which only offer the standard methods of injection or laser treatment at the earlier stages of disease, we also offer vitrectomy surgery early on. This is because early surgery has been found to increase oxygenation of the retina, whilst later surgery can often result in a poorer prognosis. Our eye specialists believe a long-term approach, encompassing surgery at an early stage, is the key to maintaining healthy vision and providing the best care. The decision about suitability for surgery is also dependent on a number of other factors. What symptoms are typical of diabetic retinopathy? What causes diabetic retinopathy and what risk factors are associated with its development? In a healthy eye, light is focused by the lens onto an area at the back of the eye, called the retina. The retina is comprised of millions light-detecting cells that allow you see the world around you. These cells, like all cells in the body, require oxygen to live. Oxygen is transported around the body in the blood, and the retina has a network of tiny blood vessels to provide it with a constant supply of oxygen. If you have diabetes, your body is unable to properly regulate the sugar levels in your blood. High blood sugar levels can cause the blood vessels in your retina to narrow, bleed or leak, reducing the amount of oxygen in the eye. In order to try to compensate for these low levels of oxygen, new blood vessels start to grow in the vitreous humour – the jelly like substance that fills the centre of the eye. However, these new blood vessels are very fragile, and over time begin to bleed, causing the retina to haemorrhage, killing the light-detecting cells and eventually causing blindness. 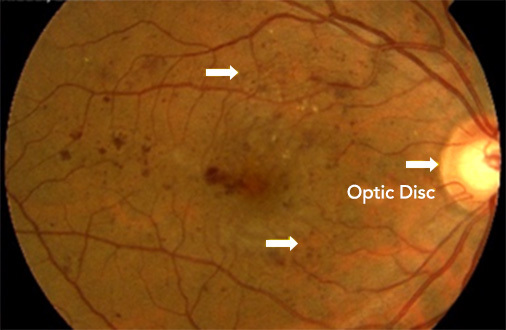 Diabetic maculopathy/diabetic macular oedema– The central part of the retina is called the macula. It contains the highest concentration of cells, and is responsible for central, high-resolution vision. When this region of the retina is affected, it is called macular retinopathy, and causes blurriness to the central vision, which generally leads to earlier diagnosis. Diabetic retinopathy – When the peripheral part of the retina is affected, the condition is referred to as peripheral retinopathy, or just diabetic retinopathy. Because the cells in the outer part of the retina are less numerous and not as important for central vision, at the earlier stages of disease there is no noticeable vision loss. It is therefore essential to regularly screen the eye for damage to the retina to ensure earlier detection, which vastly improves prognosis. Background retinopathy – there are no symptoms. However, some damage to the retina has already occurred. Tiny bulges (microaneurysms) in the blood vessels, which can leak blood, are present. Pre-proliferative retinopathy – changes to the retina are more severe and widespread, and include bleeding into the retina. Proliferative retinopathy – new abnormal blood vessels and scar tissue have formed on your retina. Because these blood vessels are fragile they can burst and bleed (vitreous haemorrhage). This can cause blurred vision and shapes floating in your field of vision (floaters). Advanced diabetic retinopathy – there is more severe bleeding into the eye resulting in sudden loss of vision (vitreous haemorrhage), or retinal detachment (when the retina pulls away from the back of the eye). At The Harley Street Eye Clinic, we use the latest retinal scanning technology to detect diabetic retinopathy at the earliest possible stage. Diagnosis is carried out through a clinical examination and medical history taking. 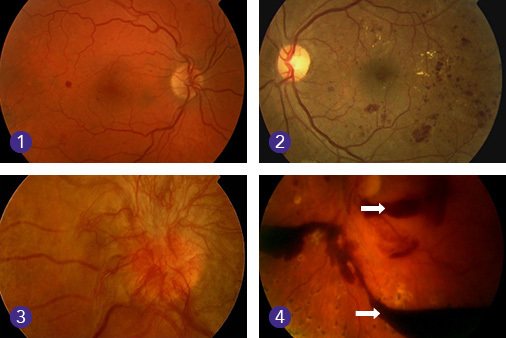 Different types of diabetic retinopathy and maculopathy, as well as staging are determined using retinal colour photography and OCT (optical coherence tomography) retinal scanning. Once the stage is ascertained, your doctor will decide on the best treatment plan for you. In the more advanced stages of disease, planning for surgery might require fluorescein angiography, which is an eye test that uses a special yellow dye and camera to look at blood flow in the retina. This may be conducted with or without another dye called indocyanine green. It involves injection of the dye into the vein of your hand followed by a series of colour photographs. 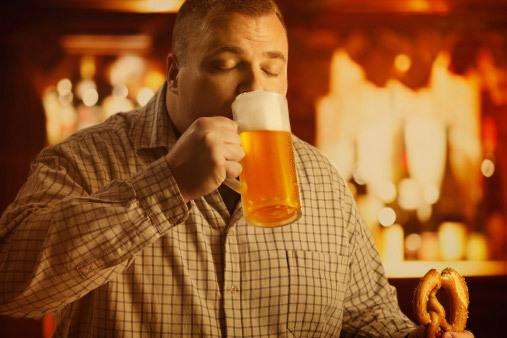 This diagnostic procedure is only required in a very small minority of patients.